A road crash that triggered deadly anti-American rioting in Kabul occurred because a military truck lost its brakes coming down a hill and plowed into a line of cars, the U.S. military said Tuesday. Chanting "Death to America," rioters on Monday stoned the U.S. convoy involved in the accident, then headed to the center of Kabul, ransacking offices of international aid groups and searching for foreigners. Smoke billowed from burning buildings. The death toll from the unrest rose to 11, most of them from gunshot wounds, according to three city hospitals. More than 100 people were wounded. Up to five people were killed in the accident, but it wasn't clear whether these deaths were among the tolls the hospitals reported. Military spokesman Col. Tom Collins, in explaining the cause of the traffic accident, said the truck's brakes "apparently overheated and failed" as it came down the long hill. "The driver, very experienced in the operation of this type of vehicle, a heavy cargo truck, applied the primary and emergency brakes and took evasive action to avoid hitting pedestrians," Collins said. The truck hit several unoccupied parked cars in an effort to slow, but it wasn't enough, and the truck hit occupied vehicles at an intersection, he said. "We extend our deepest condolences to the families of those killed and injured in this unfortunate traffic accident," Collins said. The military will compensate the victims or their families, the spokesman said, adding that a full investigation is still under way. 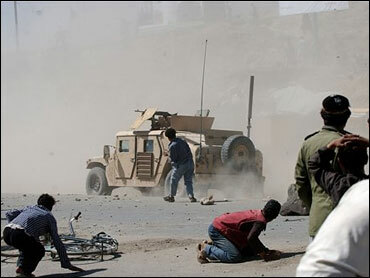 The crash sparked the worst riots across Kabul since the fall of the Taliban in 2001. Hundreds of Afghan and coalition troops took up positions around the capital Tuesday to prevent further unrest, and the city of 4 million was calm as stores reopened and residents went to work. Many expressed dismay as they surveyed the damage from Monday's riots. "Where were all the security forces yesterday?" asked Asadullah Chelsea, who owns a supermarket popular with foreigners. "I have lost thousands of dollars of stock." In other violence Tuesday, a gunman riding a motorcycle shot and killed three Afghan women working for an international aid group and their driver in northern Afghanistan, said Gov. Jama Khan Ahmdar of northern Jawzjan province. The rioters claimed U.S. troops had shot and killed civilians at the scene of the accident. A spokesman for the U.S.-led coalition confirmed there was gunfire but said coalition personnel in one military vehicle only fired over the crowd. The coalition expressed regret for any deaths and injuries, and said there would be an investigation. President Hamzid Karzai went on television Monday night to decry the violence, branding the rioters as troublemakers who should be resisted. About 2,000 troops prowled the city to enforce an overnight curfew, which passed without incident, said Gen. Zahir Azimi, the Defense Ministry spokesman. "The army has control of the city. We have tanks in the city for the first time," he said. As the violence eased late Monday, embassies sent out convoys of armored vehicles to pick up their nationals from homes and buildings and bring them to foreign military bases where they spent the night. During the rioting, an Associated Press reporter saw several demonstrators pull a man who appeared to be a Westerner from a civilian vehicle and beat him. The man escaped and ran to a line of police, who fired shots over the heads of the demonstrators. Other Westerners escaped the protesters by driving at high speed and refusing to stop when the rioters tried to block their way. Afghans often complain about what they call the aggressive driving tactics of the U.S. military. Convoys often pass through crowded areas at high speed and sometimes disregard road rules. The U.S. military says such tactics are necessary to protect the troops from attack. "There was a traffic jam and all the vehicles were stopped," said one witness, 21-year-old shopkeeper Mohammad Wali. "The American convoy hit all the vehicles which were on the way. They didn't care about the civilians at all." Patience with the 23,000 U.S. soldiers and other foreign troops in Afghanistan is also fraying over recent deaths of civilians, including at least 16 people killed by an airstrike targeting Taliban fighters in a southern village last week. The risk of civilian casualties appears to have increased amid some of the deadliest combat between security forces and militants since U.S.-led forces ousted the hard-line Taliban regime in late 2001. As many as 372 people have died in fighting since May 17, mostly militants who have been killed in airstrikes, according to Afghan and coalition figures. The Afghanistan Independent Human Rights Commission, which keeps track of coalition attacks that result in civilian deaths, said at least 135 Afghans have been killed by coalition fire since it started keeping track in mid-2003, although it does not consider its records complete. An AP estimate of civilian deaths during major combat — from the beginning of the U.S.-led invasion in October 2001 until about February 2002 — found that between 500 and 600 civilians were killed in that period. Other estimates put the toll much higher. Since then, an AP count based on figures from Afghan officials, the coalition and witnesses shows at least 180 civilians have died in coalition military action. Karzai took the unusual step last week of summoning the top U.S. commander in Afghanistan, Lt. Gen. Karl W. Eikenberry, and telling him "every effort" should be made to ensure civilians' safety.